Seven albums and 15 years into his career as Mice Parade, Adam Pierce refuses to be pigeonholed, hemmed in or even defined by critical expectations. 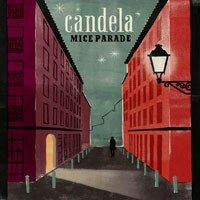 “There’s absolutely no flamenco on this record,” says Mice Parade’s Adam Pierce, who, it must be said, is a little touchy about the whole concept of world music influences. He has, indeed, studied flamenco guitar, played Chinese harps and based the percussion on one song on his new album Candela on a beat by Thomas Mapfumo. Mice Parade has now been around for 15 years and seven albums, and Pierce has spent nearly the entire time refusing to be pinned down. (It’s not hard to find old interviews where he makes the case for not being an electronic band just as strenuously as he now refutes his world influences.) Over that time, collaborators have come and gone. After Pierce, whose name can be rearranged to form the band’s name, singer Caroline Lufkin has been the main constant. Other contributors have included Doug Scharin (HiM), Dylan Cristy (The Dylan Group), Laetitia Sadier, Dan Lippel, Josh Mckay (Macha), and Gunnar Örn Tynes (múm). He has recently slimmed down his live line-up from a van-busting eight or night players to a trio -- just him, an unnamed singer and the classical guitarist Dan LaPel. Pierce got his start in music with classical piano lessons, switching to drums as a teenager, just about when people began to speculate about a future of concert halls and conservatories. In the mid-1990s, he joined Boston shoegazers the Swirlies as a drummer. He was also a drummer in the Philistines Jr. during the 1990s, and in the early 2000s played with the west-coast metal band All Shall Perish. He joined HiM as a multi-instrumentalist and singer, and played on that band’s 2001 New Features, 2003 Many in High Places Are Not Well and 2006 Peoples.